Sometime removing the animal is only half the problem. Another service offered by our Wildlife Control Professionals is cleanup and deodorizing after the nuisance animals have been removed from your home. 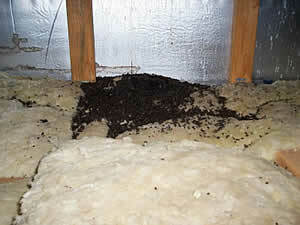 When animals have invaded a crawl space or attic, they frequently leave behind not only a mess but an unbearable odor. While everyone recognizes that distinctive skunk odor, other animals can also leave behind undesirable fragrant odors that can make your house uninhabitable. Besides bedding material and food stores, animals deposit feces and urine that can turn your home into a cesspool of debris that is beyond a homeowner’s capacity to adequately and safely decontaminate on their own. Some animal feces can also cause illness and require special treatment to insure the home occupants health and well being. Removal of Animal Waste – cleanup of urine and removal of feces and bedding material. Attic Cleanup – removal of other debris, such as damaged insulation. Repairs – replacement of damaged insulation and other repairs, as needed. Deodorizing – application of a deodorizing cleaner to eliminate those lingering animal scents and the odor of feces and urine. Fogging – some attics may require enzyme based fogging to destroy lingering organic matter to further eliminate animal odors. Once we have removed your nuisance animal, we can affect the cleanup, deodorizing and repairs to finish the job and ensure that you are living in a happy, healthy environment. We can do a complete job of animal removal, cleanup and repair to give you peace of mind and ensure the safety of your biggest investment … your home. We are your source for animal biohazard removal – skunk and dead animal odor removal.